Analysis shows why failed drug candidates cause adverse skin reactions, and yields biomarker signature to detect problems with future candidates early in preclinical development. Adverse skin reactions – difficult to predict before clinical trials – are among the most common drug side effects leading to drug attrition during development. According to a study from the International Life Sciences Institute, 64% of compounds in clinical trials trigger unintended cutaneous reactions. While some drugs will be approved even with known skin toxicity issues, adverse reactions are responsible for the failure of a considerable number of candidates that progress to trials. Recently, Pfizer halted a program designed to nurture candidates for symptoms of Parkinson’s disease, due to adverse skin reactions during non-human primate toxicology studies. The failure of the three candidates – all negative allosteric modulators (NAMs) of metabotropic glutamate receptors (mGluRs) – led the pharmaceutical company to shutter development of the otherwise promising mGluR5 NAM program. To better understand the mechanisms behind this response, Pfizer scientists turned to phenotypic profiling as a model to reproduce in vitro the reaction seen in vivo. They used the BioMAP® Diversity PLUS® panel and associated analysis tools to evaluate their candidates and other compounds, finding significant immune-related responses and a strong hypothesis for the biological basis of skin toxicity (Figure 1). Through this work, the scientists identified biomarker activities, including a signature for skin irritation, likely associated with the adverse skin reaction. The use of phenotypic profiling tools – as a component of a company’s drug discovery and development toolkit – allows teams to test for such reactions much earlier in preclinical development, potentially saving millions of dollars by failing candidates before they reach costly primate model studies or human trials. Small animal models such as mice and rats are poor predictors of skin reactions in humans. Until candidates are tested in expensive human safety trials or in non-human primate models, potential skin reactions are difficult to predict. The BioMAP Phenotypic Profiling Platform provides a robust and reliable alternative path to the resource-heavy traditions of animal testing and conventional preclinical procedures. Figure 1. BioMAP Diversity PLUS Panel Overview. The Diversity PLUS panel consists of human primary cell (top) co-cultures that model physiologically relevant disease settings. The profile of the mGluR5 NAM PF-06297470 is shown, with key modulated biomarkers annotated (middle). PF-06297470 modulates inflammation-related biomarkers linked to vascular permeability and immune cell activation. Lipopolysaccharide-response similarity (LPS), T cell dependent B cell proliferation, activation and class switching (BT) and macrophage (/Mphg) BioMAP systems identified as relevant in the study are described (bottom). 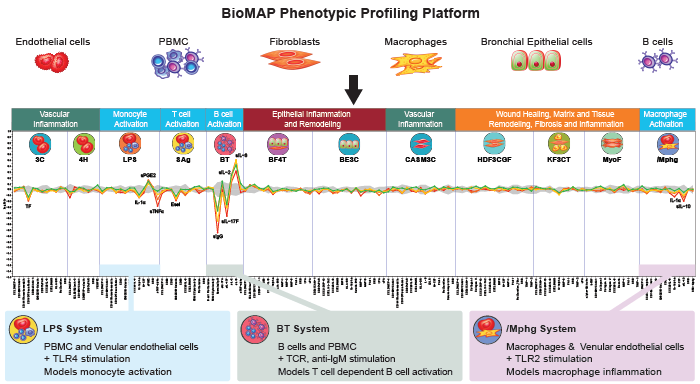 The BioMAP Phenotypic Profiling Platform provides a cell-based and data analytics-enriched approach to understand the response of human cellular environments to standardized and test compounds and combinations in vitro—providing the most physiologically relevant results. Developed and offered as a service by Eurofins DiscoverX, part of Eurofins Pharma Discovery Services, the platform uses human primary cells to model a range of tissues and disease biologies. BioMAP can quickly and robustly determine the efficacy, safety, and mechanism of action of candidate drug molecules to support pipeline progression. The Diversity PLUS panel consists of 12 individual BioMAP human primary cell-based in vitro co-culture models that predictively model drug effects on multiple tissues and disease states. Diversity PLUS was designed to serve as a comprehensive in vitro model of human disease, providing pharmaceutical scientists more insight into candidate drugs. Diversity PLUS includes 148 clinically relevant biomarker readouts determined through curation of clinical data, and incorporates information from a comprehensive Reference Database of more than 4,500 compounds for powerful and predictive analysis, making the panel broadly applicable. In non-human primate studies, the three Pfizer drug candidates that resulted in severe skin reactions caused type IV skin hypersensitivity, an immunological response involving T cells. While Pfizer’s mGluR5 NAM program was shut down due to these problems, the G protein-coupled receptors affected by these candidates mediate many functions in the central nervous system and remain appealing targets for drug discovery in neurological diseases. Researchers aimed to understand the biological mechanism responsible for the cutaneous response in the hopes of rescuing some of this compound class. For this study – published in 2017 in Cell Chemical Biology – scientists from Eurofins DiscoverX and Pfizer worked together to compare phenotypic profiles of the three failed candidates to those for two other mGluR5 NAMs that successfully progressed into clinical trials without reports of skin lesions (one from Roche and another from Novartis). All five compounds were analyzed in human primary cell-based in vitro assays using the BioMAP Diversity PLUS panel. Among the failed candidates, significant responses were seen in various immune system components. Specifically, the team identified a subset of biomarker activities in a model of monocyte activation-associated vascular inflammation associated with skin irritation and additional activities in a model of T cell-dependent B cell activation. A deeper investigation of the activities associated with skin irritation using the platform’s predictive analytics tools indicated that this signature may be triggered through nuclear hormone receptor targets, including retinoic acid receptor (RAR) and retinoid X receptor (RXR) or vitamin D receptor (VDR) agonism with aryl hydrocarbon receptor antagonism (Figure 2A). This leads to increased prostaglandin E2 (PGE2) and decreased TNFα production which can cause more vascular permeability, altered collagen ratios, increased leukocyte recruitment, and compromised barrier function (Figure 2B). Assays for these nuclear hormone receptors had not been included in Pfizer’s regular off-target in vitro safety panels. Figure 2. Biological Processes Leading to Skin Irritation Identified through BioMAP Profiling. Figure 2A. Adverse event and outcome pathway for PF-06297470-induced hypersensitivity, initiated with RAR/RXR and/or VDR agonism. Figure 2B. Activators of skin irritation identified through BioMAP phenotypic profiling (bold), and major downstream consequences. Increased PGE2 and altered Collagen III/I ratios lead ultimately to compromised endothelial cell barrier function, increased vascular permeability and inflammation. The biomarker activities identified as being associated with skin irritation have the potential to serve as a signature for skin toxicity in preclinical studies for other candidates. To determine whether a related response was seen in other drugs, the team conducted a similarity search analysis against more than 3,400 compounds in the BioMAP Reference Database. Just 29 compounds were associated with the signature tested. Of the 18 compounds that had been evaluated in human trials, all but one had been reported to cause adverse skin reactions. The study also helped scientists to clarify that the skin hypersensitivity was not due to mGluR5. Several previous findings had already suggested this, but the BioMAP information served to validate the concept, clearing the way for additional development work in this compound class. As noted in the publication, phenotypic profiling in primary human tissue models was essential for connecting the mechanism responsible for the toxicity to biomarkers that recapitulate observations in non-human primate studies. This capacity of phenotypic profiling to pinpoint a problem offers investigators powerful means to identify adverse responses early in preclinical development. Accurate modeling of human tissues and systems is a cost-effective and reliable method for guiding therapeutic strategies, prioritizing candidates, and evaluating safety and toxicity. BioMAP phenotypic profiling – including the BioMAP Diversity PLUS panel – helps scientists generate actionable data during preclinical development with the goal of minimizing adverse reactions in downstream, expensive primate studies or human clinical trials. The service can be used for rank-ordering candidates or for screening thousands of compounds to generate actionable data about safety, efficacy, toxicity, and mechanism of action—so only the most promising candidates move forward for development. BioMAP phenotypic profiling also provides a comprehensive and unbiased approach to identify new indications for existing compounds—bringing additional value to drug repurposing efforts. BioMAP® Phenotypic Profiling and analytical tools reveal biological mechanisms associated with adverse skin reactions and other toxicity challenges and generate unbiased, practical information for more efficient future drug discovery efforts. The ability to gain actionable insights underscores the value of early-stage, high throughput, human cell-based assay systems to advance therapeutic development. Sheryl P. Denker PhD is Scientific Writer and Strategic Content Manager for the BioMAP Division of Eurofins Discovery. Prior to joining Eurofins, Sheryl served as Communications Editor for the open access scientific publisher PLOS, where she established the Official PLOS Blog as a reputable source of scientific, advocacy and thought leadership updates. Her previous roles include Media Science Advisor and Writer for Burrill & Company (a life sciences venture capital firm), Sr. Program Advisor at California Life Sciences Association (formerly BayBio), Assistant Research Cell Biologist at University of California, San Francisco and Senior Scientist at Xenogen Corp. Sheryl holds a PhD in Biomedical Sciences (focus in Cell Biology and Pharmacology) from the University of California, San Diego and a BA in Physiology from the University of California, Berkeley. © 2016. DiscoverX Corporation. All Rights Reserved.